Income inequality is taken as nothing short of a religious truth among many on the left (and some on the right). But, a new report by the Congressional Budget Office (helpfully explained by the American Enterprise Institute) shows that once government benefits are factored in, the poor have seen a significant increase in “income” since 1979. As shown below, the top quintile who are more heavily-invested in volatile but generally-rising stock market investments than are most Americans, but they pay a lot of taxes. 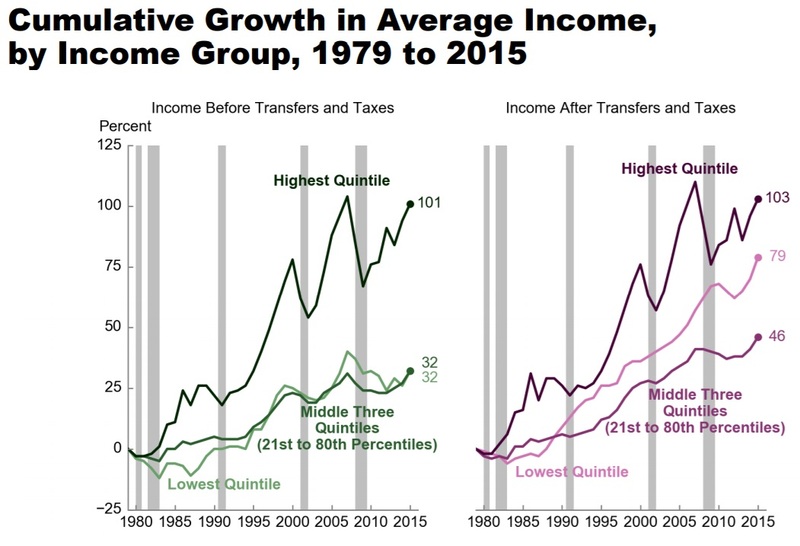 The lowest quintile income level has also seen rapid growth in income levels over the same time frame due to both “progressive” tax policies and government benefits. It’s no surprise that the media didn’t widely report this because the “rampant inequality” narrative is such a useful tool in spurring conflict, but the truth must be told. The take-away from this is that the Democratic constituency — the very rich and very poor — have prospered and the middle class has not.